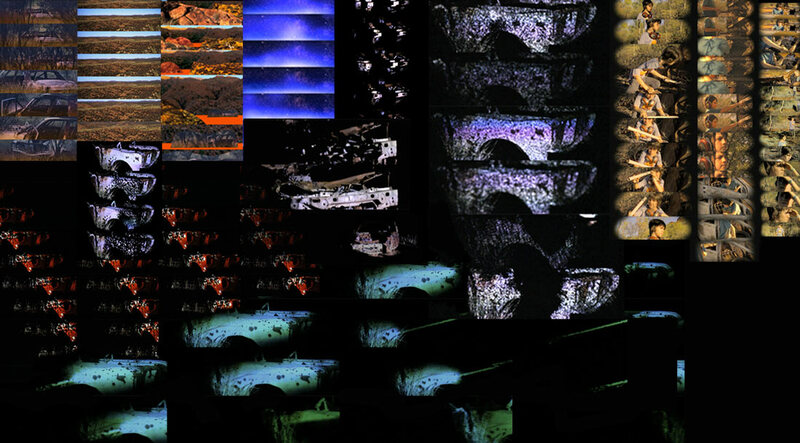 Desert Engines, a panoramic audiovisual live performance by Jean Poole and Suckafish P Jones, (30 minutes, 2013). Desert Engines explores the harsh and mysterious landscapes of Central Australia as a starting point for playful audiovisual exploration. A wandering journey reveals a desert of surprises, and car wrecks that come to percussive life after dark. Building on the live audiovisual experiments of Jean Poole and Suckafish P Jones, Desert Engines was developed for dual screen projection in 32:9 aspect ratio, and a bass heavy sound system. First performed at Wide Open Spaces,Ross River Resort, near Alice Springs, May 5th, 2013. Thumbnail Collage from 'Desert Engines'. Desert Engines, rear projection, Wide Open Spaces, May 2013.